The SWYD Sprint Triathlon is an ITU Draft legal qualifier for the 2020 Edmonton ITU Sprint Distance Triathlon World Championships. Sign up and follow the link to the British Triathlon Federation for qualification procedures. 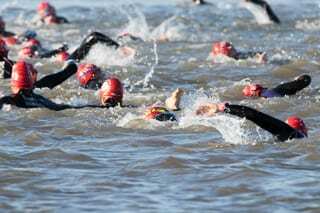 The SWYD Sprint Triathlon will be the 2019 Welsh National Sprint championship. 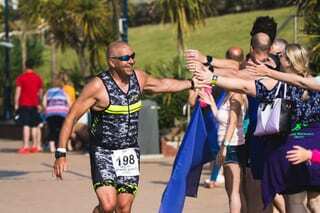 The 2019 SWYD Sprint Triathlon returns to Barry Island on the 26th May 2019. 2018’s race sold out so make sure you are on the start line by entering quickly. Have you got what it takes to beat Pritch around the Island? The age group start will enter the sea swim at 7am followed by a super fast CLOSED ROADS two lap flat bike course around Barry Town centre. After racking in the bigger transition area you will then run the 5k route taking in all of the features of the Island before finishing along the iconic Promenade before being greeted by our finishing line crew under the Eastern Shelter. Our great friends at CEP Sports UK love you so much that they will be sending the first 100 people who sign up a free pair of no show socks RRP £13.49. We will have lots more offers and spot prizes to share again this year so make sure you are on our racers mailing list by signing up. We will also be hosting two other events next season. The SWYD Swim run on the 14th July and the SWYD Sportive on the 1st September. Stay tuned to hear more about these events over the next few weeks. We are also launching a new SWYD Triathlon club…. Who’s in?